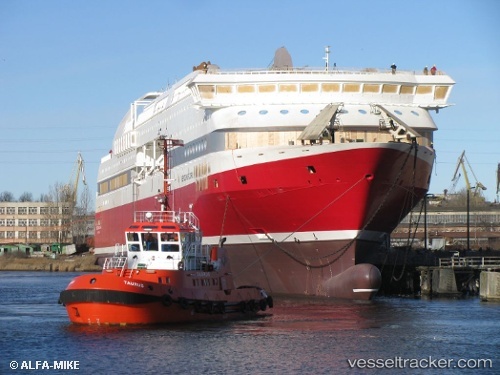 The "Bergensfjord" had to turn to port after leaving Langesund in the afternoon of July 3, 2017, and return to port because of an injured 11-year-old on board. At 3 p.m. the captain was notified that an 11-year-old girl had fallen and suffered injuries. The girl who traveled with parents was taken care of by health personnel on board. The captain contacted the MRCC, but the helicopter in Sola would have taken an hour before arriving at the ship, so it was best to turn around. The "Bergensfjord" arrived at Langesund again at 4 p.m., and the girl was taken to the hospital in Skien by ambulance. Rolls-Royce announced that its gas engines are powering the "world's cleanest ferries", the two liquefied natural gas (LNG) ferries topping the World Ports Climate Environmental Ship Index (ESI). Fjord Line ferries Bergensfjord and Stavangerford received scores of 93.9 and 93.5 respectively, puling ahead of over 3000 ships currently listed on the index. The "Bergensfjord" docked in Tananger in the morning of Jan 11, 2015, after a 36-hour long dramatic trip that started in Hirtshals in the evening of Jan 9. Storm damage in the port of Bergen meant that the ferry could not dock ther on Jan 10 but had to ride out the storm at sea after the fenders which were designed to protect the ferry in Bergen port were blown away when the ferry arrived on Jan 10. Therefore the "Bergensfjord" continued to Stavanger, but the waves were so strong the ferry was forced to seek shelter between Tysnes and Stord overnight.